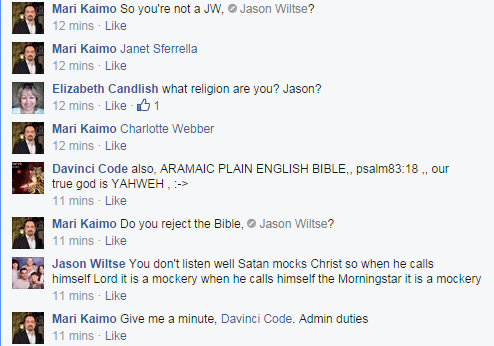 Mari Kaimo wastes no time, if you reject the Bible – you’re a heretic, which is odd in a group that is dedicated to Christian and Muslim dialogue. 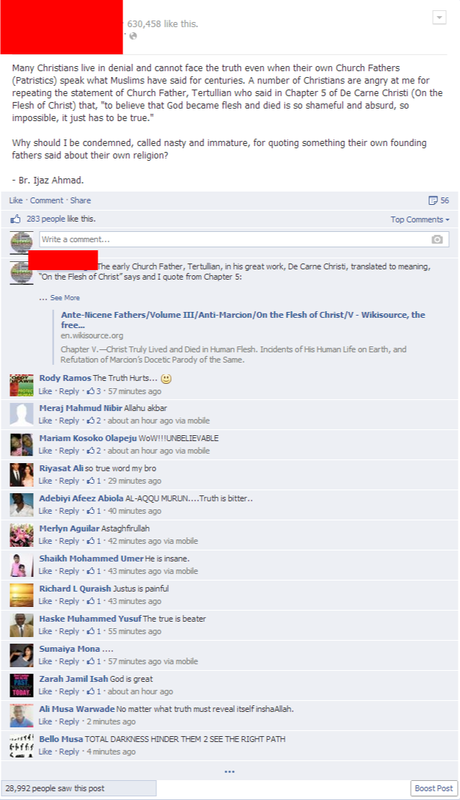 It suddenly made sense why I could find at most 1 or 2 active Muslims commenting in the group. They’ve been banning Muslims in a Christian-Muslim religious dialogue group because to them, Muslim beliefs were heretical. I’ve seen some pretty ridiculous things in my life. This is by far, one of the single most absurd things I have ever had the displeasure of witnessing. I probably stared at my screen for a few minutes, in sheer awe at the line of reasoning being played out in front of me. 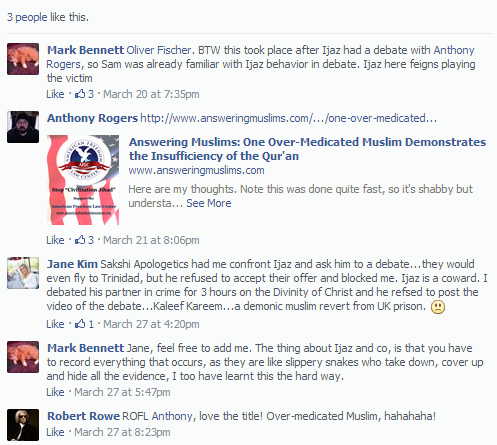 To recap….., this is a group created for the purpose of inter-faith dialogue and discussion. 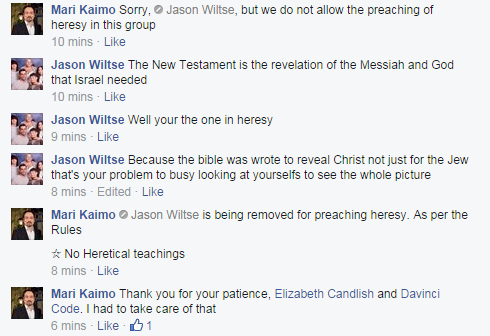 However, if you practise a religion which Christianity (as believed in by Mari Kaimo) disagrees with, you’re going to be kicked out/ removed. Surely, there are smarter people out there in the world. I’ve said it once before and I’ll say it again, this guy is a walking, talking, breathing contradiction inside and out. I pray that this is bad sarcasm at work, there is nothing, no excuse that can allow anyone to rationalize the absurdity of such a situation. If this is anything to go by, I thank God that these are the Christian Apologists and Missionaries that currently lead the Christian faith. They have made our job of conveying Islam so much easier. With people like these, there is no question as to why so many Christians quite literally get frustrated and leave the faith. 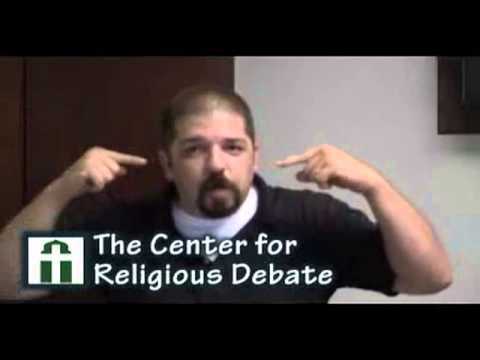 I feel embarrassed for the Christian community because of this guy, in no way does this person represent a religion with 2000 years worth of study behind it. and God surely, very surely, knows best. Contrary to this authors’ claim, Christians do not argue that Jesus is referring to himself as “a” God, as if Jesus is just one God among others. John 1 and 21 are philologically outside of the original text of the Gospel. None of the other Gospels report such language, terms or beliefs associated with Christ. The prologue is in of itself unique to John 1 and cannot be found anywhere else throughout Johannine literature. As for Exodus 3:14, along with many scholars I don’t think that it is the most directly relevant verse to John 8:58. According to the author the word for “God” in Exodus 3:14 is Elohim. Furthermore, the author tells us that for Christians this word can refer either to the Father alone or to all three persons together. But this isn’t correct, or at least it is not the whole truth, which means that our author has committed the fallacy of false choices or exhaustive hypotheses. Since all three persons are consubstantial, the word God is equally applicable to any single member of the Godhead, whether Father, Son, or Spirit, or to all three persons together. This means the word can either refer to the Father, to all three persons, or to either one of the other persons, whether the Son or the Spirit. In other words, the word Elohim can be used for the Son even as it can be used for the Father by Himself or for the Holy Spirit by Himself. If first century Jews reasoned like this author they wouldn’t have been upset with Jesus. Which is hilarious because on this occassion the Christian is willing to accept the testimony of Jews against Christ and he’s also willing to admit that the Johannine author who put those interpolated words into the mouth of Jesus is hinged on 1st century Graeco-Roman Jewish Syncretism with their Roman counterparts whom they saw the word or wisdom of God as being a distinct deity. So appealing to Jewish reasoning during the 1st century is one of the worst counter-arguments he could have used. In other words, he’s appealing to the arguments and reasoning of the same people whom Christ declared as being severely misguided on their beliefs about him, see John 8:44-48. I therefore do not see how Anthony has responded to the argument. I agree that you do not believe the Son is the Father and the Spirit unified, you do believe however, that the Son is the Son, the Father and the Spirit unified. By ignoring the argument and responding to his whims and fancies, he’s distracted himself and failed to address the point at hand which still stands. Anthony hasn’t presented any new rebuttals, this article of his was a poor attempt at responding to my Problems with John 8:58 which he has yet to refute. In essence, it seems hastily authored and filled with assumptions and ad hominem. The Problems with John 8:58 in Christian usage still stands and Anthony’s article does not add to the discourse on its use but rather distracts from it. I hope and pray he has something of substance to present next time in response to what I author, I do not consider mad ranting or inane arguing worthy of my time. His response was nothing more but an attempt to recover from the whooping he received via private e-mail discourse. I have listened to the debate between Ijaz Ahmad and Bob Siegel on the reliability of the Qur’an, and I must say that from the perspective of this detail-oriented Christian listener, the result of the debate could best be described as a stalemate. I do not find Ijaz’s arguments for the authenticity of the Qur’an (such as the claim that its message spread like wildfire throughout the known world and changed the course of history—a claim that almost any other religion could make, including Christian) to be convincing at all. That being said, however, I cannot agree with my friend Anthony Rogers in his claim that Siegel “was dealing it to him so handily.” I found Siegel’s arguments for the reliability of the Bible to be rather unimpressive. He lacks knowledge on the discipline of textual criticism (e.g. He does not know what an “eclectic text” is, even though he was clearly attempting to articulate the concept). Also, I had the distinct feeling that Siegel was relying entirely on secondary and tertiary sources for his arguments. This was made painfully clear when he attempted to address the contents of the Qur’an. Even when I might otherwise have been inclined to agree with his assertions, he never once backed up his assertions by citing chapter and verse from the Qur’an, and his failure to do so seriously hurt his ability to speak to the Islamic holy text’s claims. I was also disappointed by the way Siegel and his moderator bounced from topic to topic. I was expecting a debate on the reliability of the respective holy texts, but there were issues being thrown around that had nothing to do with that topic. The discussion on heaven and hell comes to mind, as well as the one on whose holy text is the most violent. It has been my experience that when someone resorts to jumping from topic to topic, that is a sign that they have given up on attempting to argue for the central thesis of their debate. As for Ijaz Ahmad’s debate performance, I have to give kudos to him for restraining himself from making any kind of snide comments or below the belt attacks in this latest performance (though I cannot speak to any of his past debates in that regard). The one thing that I respect about him is that he attempts to step up the game from previous Islamic apologists who have done little but parrot the claims of old-style polemicists such as Zakir Naik. He does attempt to critique Christianity at a scholarly level by looking into academic sources (including primary sources) on textual criticism and early Christian history. 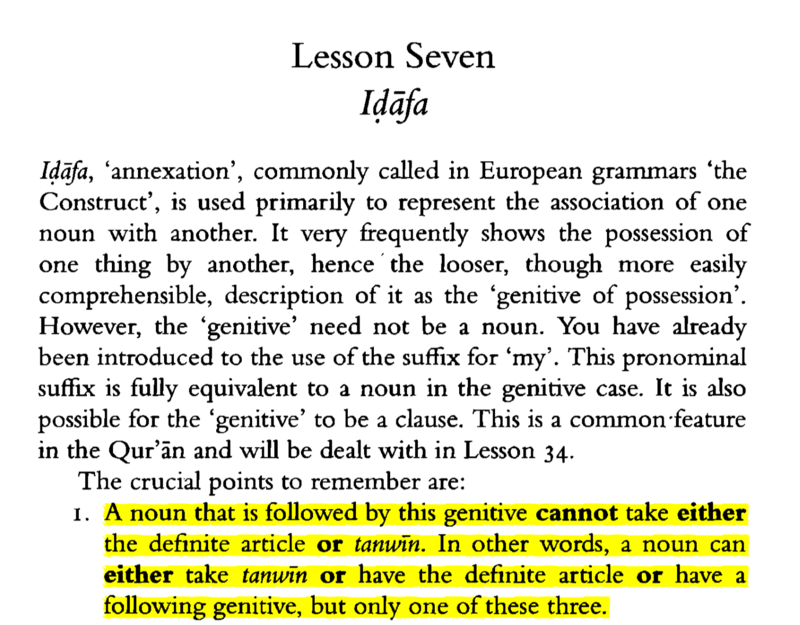 Whatever else one wishes to say about Ijaz, he is certainly no slouch when it comes to doing research in producing his arguments. Finally, I must speak on the issue of Christians leveling ad hominem attacks against Ijaz in their reviews of his debates. I totally understand how in the heat of the moment, we can become very adversarial in our treatment of those we are in opposition to. However, some of the statements that are being made against him are simply unwarranted and—from a Gospel-centered perspective—un-Christlike. No, do not excuse your attacks by saying “well, he does it too”. 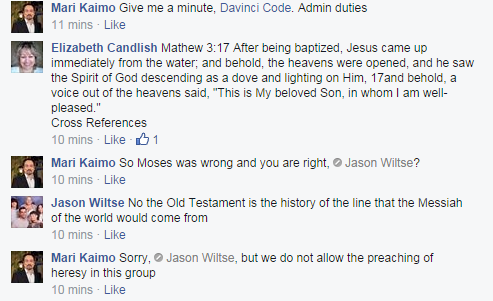 The tu quoque fallacy was and still remains a logical fallacy, so resorting to it will do no good here. I would like to remind my Christian brothers of the words of the apostle Paul: “Let your speech always be gracious, seasoned with salt, so that you may know how you ought to answer each person” (Colossians 4:6, ESV). Perhaps once we all—Christian and Muslim—rise above these petty personal squabbles, we can accomplish something genuinely constructive in our intellectual debates and exchanges with each other.